Western Front Media Arts in partnership with the Goethe Satellite is pleased to present IRL, an exhibition investigating a material and sculptural turn in recent Internet art practice. IRL, internet slang for “in real life”, brings together artists based in Canada and Germany as a survey of work focusing on the tension between virtual and actual space. Each work in IRL has a double life, one online and another in the material world, in this case, the gallery space. Vancouver-based group WALLPAPERS produces large scale, computer generated atmospheric projections and a growing collection of digital images that can be viewed online at w-a-l-l-p-a-p-e-r-s.net. 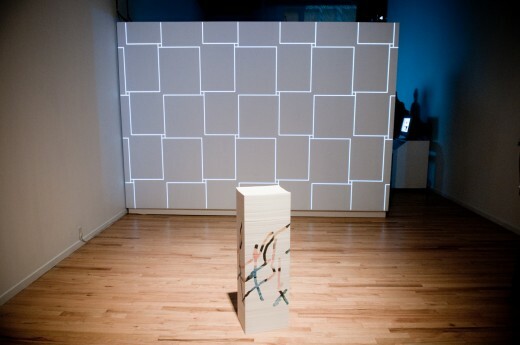 WALLPAPERS translates the computer screen into the context of physical space, conceptualizing the wall as both an architectural element and the background of one’s computer screen. Oliver Laric presents the latest incarnation of his ongoing series of videos titled Versions (2009-2012). Versions centers around a concern for the way in which objects are mediated, authenticated and valued through technology. Employing a range of shifting historical and contemporary reference points Laric examines how objects circulate through various technologies. Fittingly, Laric’s Versions series can be viewed in its entirety online at oliverlaric.com, disrupting traditional methods of moving image dissemination. 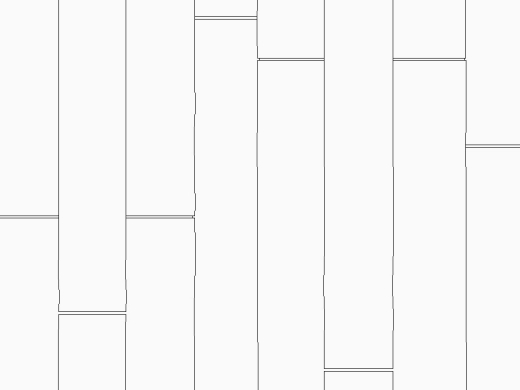 In Once Upon http://1x-upon.com/, internet art pioneers Olia Lialina and Dragan Espenschied recreate three widely-used contemporary websites – Pinterest, Google+ and Facebook – in the spirit of late 1997. The websites are displayed on PCs and computer tables from the late 1990s and are not interactive, rendering each workstation a tongue-in-cheek sculptural remembrance of technology from the recent past. 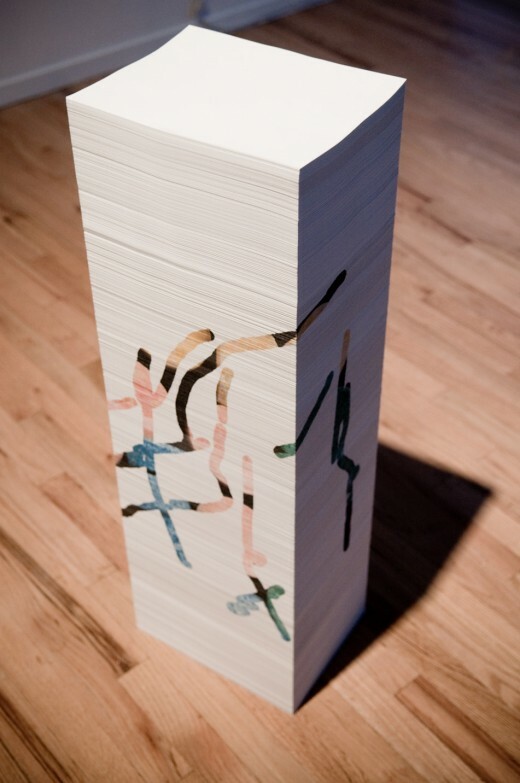 Similarly monumental is Aleksandra Domanovic’s series of paper stack sculptures, which are distributed online as printable PDFs. The large-scale paper stack sculptures address a range of subject matter including the now defunct .yu domain name of the former Yugoslavia. Untitled (19:30), the paper stack featured in IRL, is part of Domanovic’s 19:30 project in which the artist researches and repurposes television news themes from the former Yugoslavia. Here, a virtual PDF file is made physical through the most quotidian of technological materials – copy paper, inkjet cartridges, and the labor of in-gallery printing and construction. This exhibition is produced in concert with the Pro-Am: Arts and Culture on the Internet conference September 28 – 30th. Dragan Espenschied is a media artist and musician based in Stuttgart, Germany. He studied communication design at the Merz Academie in Stuttgart where he is now a professor. He has worked on projects with media activist Alvar Fruede and net artist Olia Lialina, with whom he co-edited Digital Folklore Reader in 2009. Oliver Laric lives and works in Berlin. He studied at the Universitat fur agewandet Kunst Wein. Recent solo and group exhibitions include: alienate/demonstrate/edit at Artspace, Auckland (2012), Villa de Parc Centre d’Arte Contemporain, in Annemasse, France (2012), Kopienkritik at Skulpturhalle Basel (2011), Frieze Projects atFrieze Art Fair, London (2011), Memry. atMass MoCA (2011), and Unmonumental at the New Museum in New York (2008). He is the co-founder of the VVORK platform (vvork.com). Olia Lialina is a pioneer of internet art active since the early 1990s through her site teleportacia.org. Currently, Lialina is a professor in the Pathway New Media of Merz Akademie, a design and art school in Stuttgart, Germany. Her most recent research concerns what she calls the “vernacular web” and digital folklore. In 2010 Lialina held a research fellowship in the Communication in a Digital Age program at the Piet Zwart Institute and at the Willem de Kooning Academy in Rotterdam where she undertook a comparative study of the popular media culture in the telecafés and small Internet access shops of Rotterdam, Stuttgart, and Moscow. With Dragan Espenschied, Lialina co-edited and contributed to Digital Folklore Reader, an anthology of writing about venacular web-based culture. WALLPAPERS is a collaborative project that brings together the individual practices of three Vancouver-based visual artists, Sara Ludy, Nicolas Sassoon and Sylvain Sailly. 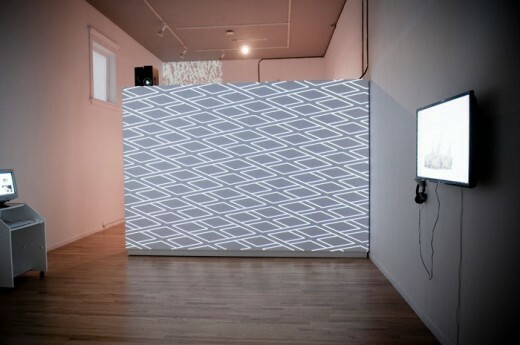 Referencing imagery and formats often drawn from computer graphics, the artists create a growing catalogue of digital patterns that are exhibited online at w-a-l-l-p-a-p-e-r-s.net as well as being produced offline as site-specific environments. Previous and upcoming exhibitions include WALLPAPERS NYC at 319 Scholes in Brooklyn, N.Y., PAMI Festival atThe Sunday Painter in London, U.K. and the New Forms Festival in Vancouver, Canada. IRL is a project by the Goethe Institut in cooperation with Western Front Media Arts and Revised Projects. IRL (installation view), Western Front, 2012. Photo by Katie Huisman.